The Navajo and Zuni tribes believe that by wearing animal fetish jewellery the attributes of the animal are bestowed upon the wearer. In legend, the Horse is like the wind. Its attributes are speed, endurance, power and freedom. When Horse agreed to carry man on its back, it transformed the Native American nations from slow-moving nomads into powerful mounted warriors. Horse also teaches us the responsibility that goes with power and freedom. 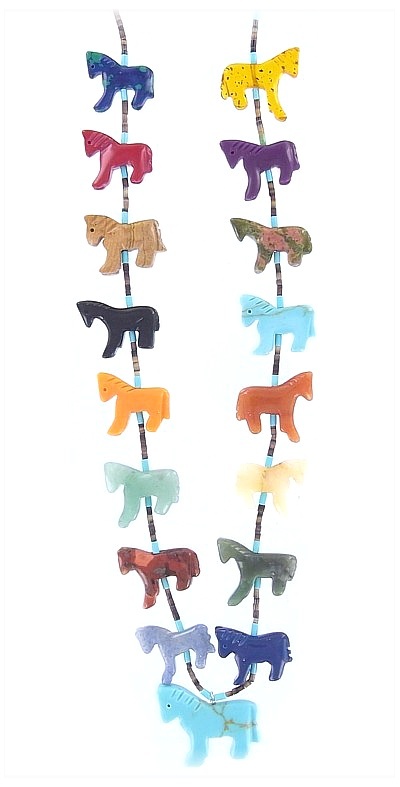 Meticulously carved in the Design Studio on the reservation in New Mexico, this necklace features 17 horse carvings in a variety of semi-precious stones, which makes it extremely powerful. It also acts as a tribute to the fast-disappearing herds of wild mustangs which once roamed the American plains. Stones carved from: Turquoise, Lapis Lazuli, Adventurine. Length: 75cm.